Download TAudioConverter latest version free. TAudioConverter is a multithreaded audio converter-extractor and CD Ripper. TAudioConverter support various encoders. It can convert to MP3, AAC, AAC HE, AC3, MusePack, Ogg Vorbis, Opus, WMA, DTS, ALAC, FLAC, Monkey’s Audio, TAK, TTA, WavPack, AIFF and PCM. TAudioConverter is multithreaded. This means that it will run several encoders in parallel to shorten encoding time. The number of parallel processes depends on the CPU cores you have. 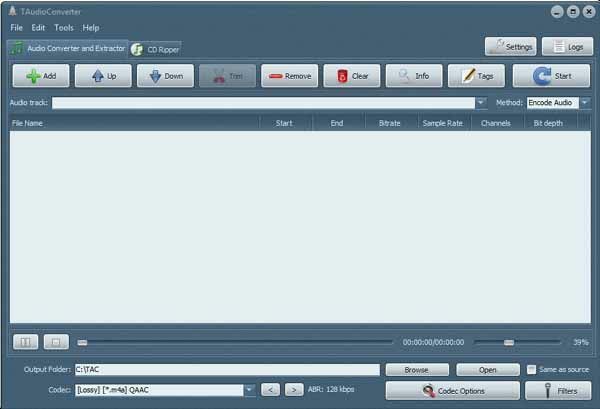 It can also extract audio streams from video files. This can be done with or without encoding the audio stream. Even if your video file has more that one audio stream, you can select the one you want. CD ripper has freedb support. Audio Merger. Merge several audio files into one. It can copy tags and cover art from source. TAC can split cue sheets. TAudioConverter can apply certain effects to audio. It can change audio volume level and playback speed. TAudioConverter is free open source software.